Faith communities joined a nation-wide Day of Action last weekend against Adani’s proposed Carmichael coal mine, reports the Australian Religious Response to Climate Change (ARRCC). 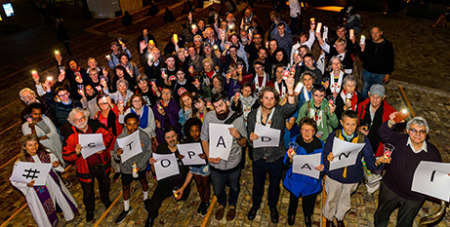 Hundreds of Catholics, Anglicans, Buddhists and others, from a range of traditions, attended three meditation and prayer vigils, in Sydney, Melbourne and Kiama, organised by the ARRCC. People of faith also participated in dozens of massive #StopAdani events across the country. As Adani pledges to start work in October, a groundswell of community opposition is building in a way which is reminiscent of the Franklin Dam protests in 1983. The Australia Institute has calculated that annual carbon pollution from burning Galilee Basin coal in India would be more than the annual emissions of Sri Lanka, more than Bangladesh, and equivalent to that of Malaysia. At least a third of ARRCC's organisational members are Catholic, including Catholic Mission, Caritas Australia, Catholic Religious Australia, Catholic Earthcare, Edmund Rice Centre and a number of religious orders.